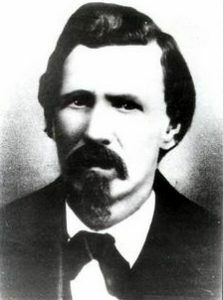 William J. Brady (1825-1878) – Brady Served as the sheriff in Lincoln County, New Mexico during the Lincoln County War. He was killed by Billy the Kid and the Regulators. Born in Corvan, Ireland in 1825, Brady emigrated to the United States and fought in the Civil War with the 2nd New Mexico Volunteers. When the war was over he became close friends with two other Irish immigrants by the names of James Dolan and Lawrence Murphy, the owners of the Murphy & Dolan Mercantile and Banking operation in Lincoln County, New Mexico. With their support, he was elected as the Lincoln County Sheriff in 1975. In 1876, Alexander McSween and John Tunstall, fed up with Dolan and Murphy’s virtual control of the county’s economy, set up a rival business. This, of course, upset Dolan and Murphy, who had become accustomed to their nice profits. Dolan attempted to goad Tunstall into a gunfight, but Tunstall refused. However, he soon hired Billy the Kid and other gunfighters to protect his interests. In February, 1878, Dolan and Murphy obtained a court order to seize some of Tunstall’s horses as payment for an outstanding debt. Sheriff Brady and a posse soon went out to take the horses and in the confrontation on February 18, 1878, Tunstall was killed, an event that erupted into the Lincoln County War. Billy the Kid and the other men fighting for the McSween faction, called the Regulators, soon set about taking revenge. On April 1, 1878, Billy, along with several other Regulators, which included Frank MacNab, Jim French, Fred Waite, Henry Brown, and John Middleton were involved in a shootout with law enforcement in front of the Lincoln County Courthouse. When the dust cleared, William Brady and his deputy, George Hindman, lay dead.